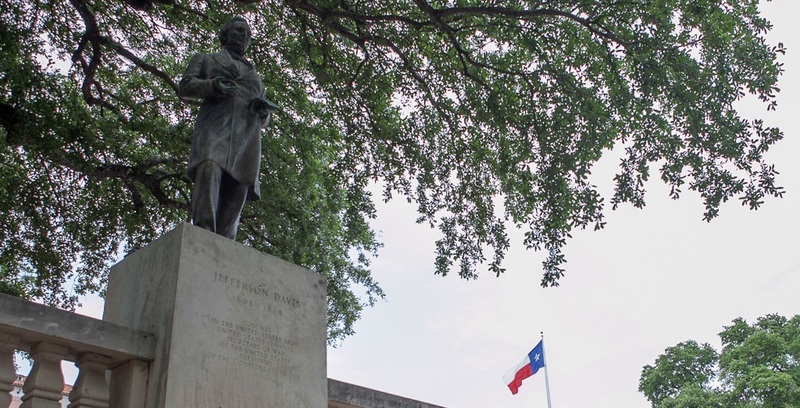 Four statues on the University of Texas at Austin’s South Mall and an elegant fountain sculpture by Pompeo Coppini bear the names of men who have become villains du jour because of their ties to the Confederacy and the recent murders at a black church in Charleston, South Carolina. Until UT’s statues began to be defaced with paint and graffiti, I wonder how many students on the mall ever stopped to look at them — to think about or even wonder who they were. I know I didn't during my years in graduate school. Coppini’s sculpture of horses running through water honors George Littlefield, who was crippled by a cannon shell blast in 1863 while fighting in the Civil War with the cavalry Terry’s Texas Rangers. Pioneering the use of windmills and barbed wire, Littlefield established a vast ranching empire in West Texas and New Mexico, founded an Austin bank and became a UT regent in 1911. John Reagan rose from county judge to congressman in East Texas and was the Confederacy’s postmaster general. Captured with President Jefferson Davis, Reagan wrote an open letter from a solitary confinement cell urging Texans to submit to federal law and renounce secession and slavery. Reaction was ferocious, yet he was elected to 12 more years in Congress and chaired the new Texas Railroad Commission. In 1836 Albert Sidney Johnston enlisted as a private in Texas’ revolutionary army and became the Republic’s secretary of war. As a U.S. officer he helped defend settlers against Comanches and Kiowa raiders. In 1862, as a Confederate general he was killed at Shiloh. Young Robert E. Lee also helped defend the Texas frontier. He excelled in the Mexican War and forced the surrender of John Brown and followers after they seized a federal armory at Harpers Ferry. For five years Lee thought he had to retain the slave labor of his father-in-law to spare the estate from bankruptcy and forfeiture. Lee freed those slaves in 1862 and never owned another. He opposed secession. After the Civil War was lost, his conciliatory leadership won out over die-hard radicals who wanted to continue a guerilla insurgency. Jefferson Davis came to Texas as a regimental commander in the Mexican War. A Mississippi planter and congressman, he championed Texas’ entry in the Union as a slave state. During his time as U.S. secretary of war, his grand experiment was using camels as army pack animals in West Texas. After the North drove old Dixie down, as the song goes, the Confederate president lit out for Texas and hoped for safe haven. After two years in prison but never tried, Davis in 1875 graciously declined an offer to be the first president of the Agricultural and Mechanical College of Texas. The Aggies dodged a bullet on that one. Imagine where this might go if all of Texas were like Austin. After two terms as governor that Lawrence “Sul” Ross won for having been a Confederate general and claiming to be a great Indian fighter, he led Texas A&M University as president from 1891 to 1898. Could the Aggies disown Ross, so revered that students place coins at the statue of “Sully” for luck on exams? Could Sul Ross State University in Alpine be in line for a name change? What about Jeff Davis County and the town of Littlefield? Would Robert Lee, Texas, be rechristened Dry Lake, Texas? Tinkering with history is a feckless and absurd business. The administration proposal, on hold while the Sons of Confederate Veterans seek a restraining order, is being called reasoned, but the apt word is convenient. What will the educators do if the defacing continues on the others? This panicky stampede is a surrender to vandals armed with cans of spray paint. As violent, cruel and bigoted as Texas history has often been, this tempest in a political teapot does nothing to change that. Leaders who try to airbrush our state’s past will soon be forgotten. And unlike a Robert E. Lee, they deserve to be.